Please note you cannot reset the password if you previously logged in using your Facebook account. You must use the Log In with Facebook button to log in with a Facebook account. Warning! You are not logged in, your mission will not be saved to your account. After saving the mission, if you are logged in to your account in the Litchi mobile app, the mission will be sync'ed automatically to your device. Alternatively, download the mission after saving it, go to "Missions"->"Open"->"My Missions". Then place the downloaded file inside your mobile device's Litchi missions folder. The folder is located in "LitchiApp/missions" on Android and "Litchi/missions" on iOS. On iOS, you will need third party software to transfer the mission files to the app folder (such as i-funbox). 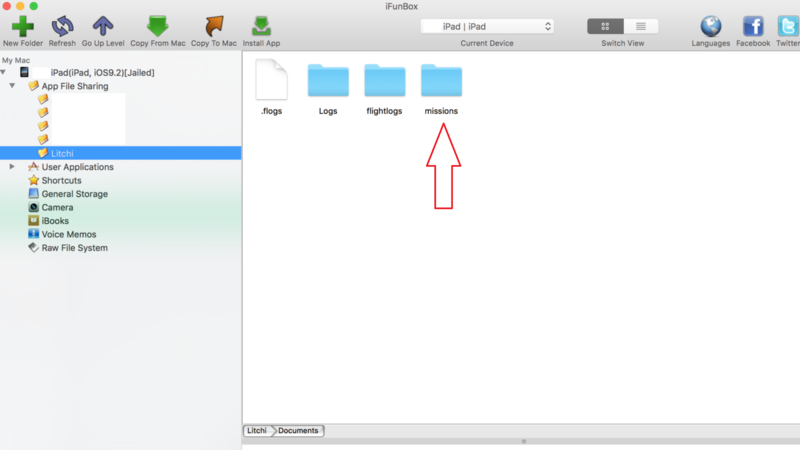 This screenshot shows where to place the files on your iOS device. We’ve recently moved to new servers. If you want to continue enjoying the features of Mission Hub, be sure to update your Litchi mobile app to the latest version (iOS 1.11.0 or higher, Android 3.7.0 or higher). You can check the version of the app in the app's settings. Online Elevation can no longer be enabled until further notice. We hope to be able to re-introduce it in the future. Holiday Giveaway, win $200 worth of Amazon Gift Cards! To enter the giveaway, create or load your own mission and make sure it is saved to your account!